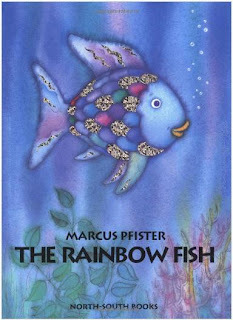 This week Joshua brought home another book from school, The Rainbow Fish by Marcus Pfister. We had this book before we moved, but it was a little old for our kids. Now we have the joy of reading it again, when they can understand more of the truths taught in this story. The rainbow fish is the most beautiful fish in the ocean, but he is proud and refuses to play with the other fish. One day, a little blue fish asks him for one of his beautiful scales. The rainbow fish is incredibly rude. Soon, none of the other fish will even go near him. He goes to the wise old octopus to learn what he should do. The octopus tells him to give away his beautiful scales -- he will no longer be the most beautiful, but he will learn how to be truly happy. Can the rainbow fish sacrifice his most precious possessions, his scales? Or will he continue to be beautiful and spend all his days alone? This sweet story teaches about the joy found in giving and sharing in a beautiful, colorful way! This is such a classic... and yet I've never picked it up! Will need to put on my girls' summer reading list. It sounds like a wonderful book. How did we miss that one? I love all the pictures in this book...so pretty! I don't own a copy of The Rainbow Fish, but we do have a flap book about the Rainbow Fish that my girls enjoy. I think the original story is better, though! Just lost my comment b/c I forgot to enter security word. Anyway, I will have to reread this one it's been awhile. I love the family pic in the header! The first time I picked this one up it was way too old for my little one. But it sounds like it would be a good read for her now. I'll have to find it again at the library! Thanks for the recommendation. You know what's funny, I used to read this to T when he was much younger. We must have the board book:) I have to find it and put it back in rotation. It is a great book for kids. Thanks for reminding me of this one!